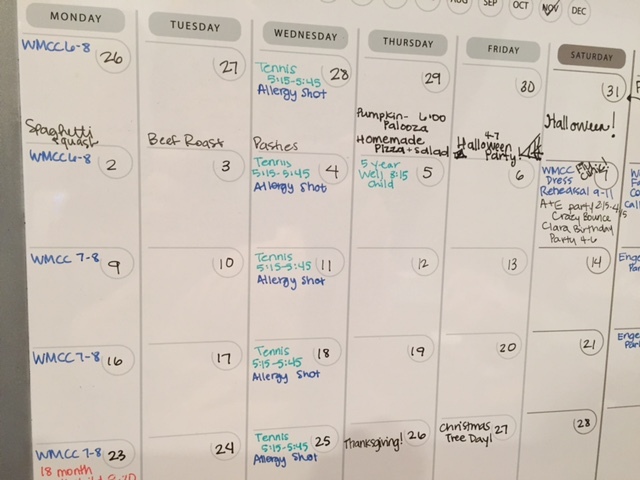 This post is about planning, and how completely helpful and life changing it is. It is also about how sometimes I hate plans. Write it down in pretty colors, make it happen. It isn’t a particularly glamorous day, but it is easily digested. I love a day without question marks, without gaps. And if* everything goes exactly as I’ve planned, I absolutely, positively LOVE plans. Let’s look at the goodness of a plan for a moment. When I was first married, I did not know much about cooking, eating right, or stocking a kitchen. Every meal was one big question mark. I’d stare at the pantry and have no idea how to put a meal together unless every component came from a box. Forget about raw meat and fresh produce — I had no idea how to make those things taste good. And considering how much more money they seemed to cost than their processed counterparts, the move was financial as much as it was practical. Any time I wanted to try a new recipe, I had to go out and buy everything for it, since I didn’t have a well stocked pantry. I’d spend a lot of money on items I used once. I didn’t have many cooking skills, so I was never pleased with the new recipe, and I wouldn’t make it again. All of those ingredients sat, unused, spoiling. And so, in that season, our staples were rice and beans, boxed dinners, and, if we were feeling especially health-conscious, salads (covered, by me at least, with heavy cream dressings). I can’t say eating home cooked meals was the best experience during that time. They were both high in sodium and incredibly bland, a combination that baffles me now. They didn’t refresh or renew me. If I ate enough, they satiated me, and that was no small feat on our incredibly small first married income. I wasn’t happy with meals, but we had enough, and I saw no reason to change. Fast forward to the birth of John. Friends brought us meals — real meals. I remember one friend, who was my age, brought us chicken cordon bleu she had made herself. Five years later, I still remember how much I loved it and how shocked I was that she made it from raw chicken breasts (something I was still flat out refusing to work with). Then John started eating. I had mostly breastfeed him until this point, and I was a little self-righteous about it, I think. I had already given him such a healthy start, I wanted to keep that up. So instead of buying pre-made jars, I bought fruits and vegetables (some for the very first time, I will admit) and cooked and pureed and froze homemade baby food. Then he started eating more foods, and I wanted him to have a variety of things to choose from, so I made sure each meal had some fruits, some vegetables, some dairy, some protein. His balanced meals became our balanced meals. Our balanced meals meant that we had to decide in advance what kinds of foods we wanted so we could cook them without them going bad first. My meal plans were born. 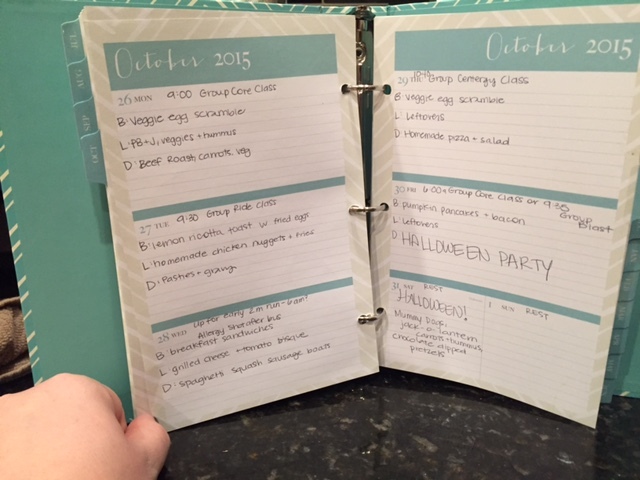 I’m not saying you HAVE to have a cute impulse purchase planner from Target to plan your meals in… but, I mean, it helps*. *There is no evidence that it helps. I started with dinners. Breakfasts and lunches were (and still occasionally are) up for grabs; a combination of scrambled eggs and leftovers. The dinner plans started very simply. Macaroni and cheese (with peas in it — healthy). Stir fry (with fresh produce AND raw chicken — this one still impresses me even though I have now swapped store bought sauce for homemade). This started around the advent of Pinterest, so I would try new recipes. Some were fantastic (roast all of your vegetables! ), and some were… not (do not make orange chicken in your crock pot; trust me on this). If meals weren’t great, I would either try making them again, tweaking some ingredients, or I’d find another recipe that would help me use the remaining food items. All of this led to my meal planning as it is today. I don’t spend money on foods we won’t use, and I don’t have an excess of foods going bad (usually). See! I love a plan! Ev woke up completely covered in his own vomit. John woke up with… the opposite problem. It’s safe to say my home is a breeding ground for germs at the moment. Stay away for your own good. I still got out the beef roast I had planned for dinner, and Jay put it back. I got it out again, and then I looked out at my family, drinking gatorade and making a king’s feast out of three saltine crackers. There will be no roast tonight. As I’ve struggled with body image lately, I made a plan to try a new group class at the gym everyday this week. As it turns out, they do not want your kids in childcare if they are vomiting and etcetera. There will be no group class today. Make the roast tomorrow, Jennie! Find an exercise DVD you can use at home! I know. I know. Logically, I know. But practically, I’m sad my good day, my normal day, has been replaced. It’s hard for me to regain momentum once I’ve slowed. It’s Tuesday, and I consider the rest of the week a loss. It isn’t sensical, but it’s real. So I have a challenge for you and a challenge for me this week. If you don’t plan meals, give it a try! Start simple. In a few days I’ll post some of my favorite homemade recipes that I consider to be my prime staples. If you do plan meals, try, like me, to allow yourself some human flexibility. Things will happen and plans will change. Tell yourself this. A lot. If you already plan your meals and you are excellent at cutting yourself some slack, congratulations! You’re my new life coach.